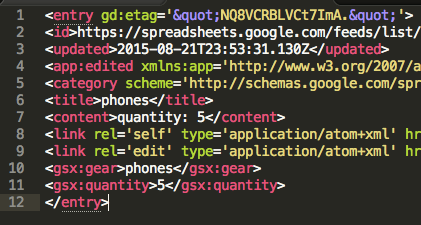 My previous Sheets API post demonstrated how to add rows to Google Sheets with PHP. Some readers were interested in editing or deleting rows. Google has a very informative reference here that describes the list-based feed for manipulating sheets. All of my scripts have been using this method, which requires the sheet to have a single header row (I’d been lucky to use that format without knowing the requirement). I use the example HTTP code from Google’s reference pages to give me guidance for my PHP. When you get the sheet list feed (Section 3 of the first file in the gist), you need to add a header (“GData-Version” => “3.0”) to the GET request so that the Etag is returned for each line. Once you have a list of entries and find the one that you want to edit, you need to grab its Etag, Id, and the edit URL (see lines 1, 2, and 9 in the image above, and click on the image to see the whole entry). Now you just need to issue a PUT request to the edit URL and include the XML with the Etag, Id, and updated sheet data. This entry was posted in Google Apps, webdev on August 21, 2015 by karl.kranich.